Restorative materials pose a significant challenge for many clinicians when dealing with an implant case. Balancing the needs of the patient with intended outcomes for aesthetics, overarching case considerations, chair time, and finances can be understandably tricky. 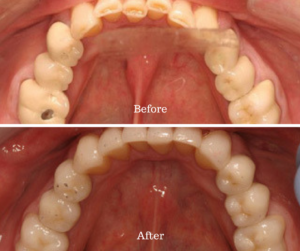 In this case, Dr. Shapiro presents pre- and post-op photos and his treatment procedure for a complicated implant rehab. Read on to learn how he worked with Gold Dust to integrate many different materials for a gorgeous final result. 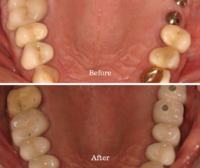 The aesthetic predictability of a dental rehabilitation can be complicated by utilizing mixed media or different restorative materials on adjacent teeth. 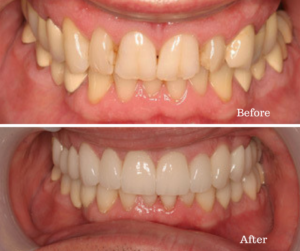 The patient in this case came to me with a desire to restore function and improve the appearance of his smile, which was an important motivator for treatment. Pre-operatively the patient presented with existing failing restorations, missing teeth #14 and #15, along with aggressive anterior wear. In developing a comprehensive treatment plan with a focus on function, we opted to phase this patient’s treatment by completing the lower arch with a laboratory that didn’t quite meet my aesthetic demands for contour and anatomy. After consulting with Gold Dust regarding the second phase of the rehabilitation, we developed a plan to restore teeth #6-10 with Ivoclar’s IPS Empress, #11 with Lava and custom gold abutments, InLine PFM restorations on #3-5, 12, 13, and implant PFMs on #14 and #15. I’m very pleased with the result and the integration of a variety of materials that blend. Together, they offer the vitality that I was looking for in this case, with the strength and function that meet my patient’s needs. What are your favorite implant materials? We’d love to hear from you in the comments! And don’t miss the last case of the month, check it out here.